JayneStars’ new music video roundup for this week includes three dance tracks from Hong Kong’s Big Four, and Taiwan’s Show Lo and Cyndi Wang. Only the best filtered for your listening pleasure! 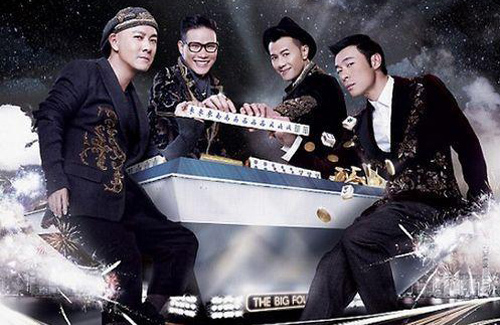 The four brothers, Dicky Cheung (張衛健), Andy Hui (許志安), William So (蘇永康), and Edmond Leung (梁漢文), are finally back! I have been a quiet fan of Big Four since their formation in 2009. The four of them each had their own successful music and film careers before grouping together, so their formation was a pleasant surprise and unexpected. “Everyone is Lucky” was also a pleasant surprise. A great surprise, actually, because I am absolutely loving the song. It’s not the first time seeing Big Four tackling a dance track. Their so-called debut song – self-titled “Big Four” was a dance track, but the song was neither catchy nor pleasant to listen to. Seeing four, middle-aged man attempting to dance is also not what I had in mind when viewing the MV. “Everyone is Lucky” is a hip hop dance track, and while Big Four also tries to bust out some dance moves for this one, it does not hurt my eyes as much. Big Four is mainly a vocal group, so I forgive them for their horrible dancing skills. The song is nice, but the MV is not. I am immediately reminded of Far East Movement at the start of the video, both in terms of the style of the song and the style of the MV. The MV is also too crowded with awkward filming angles. This song shares a lot of similarities with American electropop dance songs. Although it is not groundbreaking music, it is something you do not normally hear in Cantopop, which is what makes this song special. This song has no autotune! Is that a bad thing or a good thing? I have always liked watching Show Lo’s (羅志祥) MVs, and this one was no exception. I appreciate Show’s efforts in making each and every one of his MVs both similar and different at the same time (similar, as in the title of his songs always involve the word “dance”; different, as in he manages to keep the creativity consistent with the repetitive dance title). The MV makes the actual song much more interesting to listen to. The MV had a budget of over $8 million TWD. Also, the military tank and a jet turbine engine seen in the MV is not CGI, but the real thing. I am very used to seeing Cyndi Wang (王心凌) singing ballads or bubbly bubblegum pop songs. “The Capricious Lover” is a dramatic change from that image I had of hers. The song is very catchy, the dancing is slick and smooth, and Cyndi is also very gorgeous, but who directed this music video? I got a huge headache from watching it. The colors are all over the place, and the camera is also all over the place. I am also not very fond of Cyndi’s panda background dancers. Note: This review is written for JayneStars.com. DO NOT re-post this article on any other websites. No part of this article may be copied, reproduced, rearranged, redistributed, modified by any means or in any form whatsoever without prior written permission. You may use the content online and for your non-commercial, personal use only. Copying these materials for anything other than your personal use is a violation of copyright laws. Should you wish to share this article, we recommend that you: (i) link directly to the article at JayneStars.com on your website; or (ii) share this article link via social media sites such as Facebook and Twitter. Did you notice that the director of Big Four’s MV is Wilson Chin? Maybe the nightclub theme and dancing girls may have alerted you. I didn’t like the MV direction that much, lacking creativity, but the lyrics are meaningful about turning one’s luck around, which applies to the 4 stars of Big Four. In “Everyone is Lucky,” I like Andy Hui’s vocals the most. They will be having a world tour concert in 2013.
i have to go to their concert 😀 these are my fave guys. I did enjoy Andy a lot but also love William So’s voice. I find the other 3 voices to be a little too soft. i actually watched their big 4 interview with big stars and loved how they collaborated with one another. I am actually not very familiar with Wilson Chin. I’ve seen his Gangnam Style parody, and I know he produces some of TVB’s programs, but that’s about it. I also like Andy’s vocals the best. William comes to a very close second. And I can never take Dicky seriously. Wilson Chin Kwok Wai produced “Beautiful Cooking” and the nightclub films, “Lan Kwai Fong 1 & 2”. I laughed when I saw the MV because of the nightclub setting and women draping themselves in the overly crowded plane. Very reflective of Wilson’s style. I like the comraderie of the big four. I never knew they actually is a group, I thought just 4 individuals having concert together. However my feeling is Edmond Leung seems to be riding on the fame of the 3 others. I never thought Edmond was famous enough or successful enough. Of course for all 4, is it correct to say musically Andy Hui is the most successful? I think popularity wise, Andy Hui and William So are equal. Edmond Leung’s has some great songs and hit, but, don’t know why he’s not as popular as William and Andy. I think he’s a very good singer. I love TVB themesongs he sang. I didn’t know they are officially a band too. I thought the Big 4 is like 4 Heavenly Kings or S4. We know who are the Kings, but, they are not a group. I like this band. If they really is an official band, then, I really like this band. They are not a manufactured band but a band that are form by a group of friends. This is how bands used to be form. 2) Edmond Leung supposedly cursed publicly (at a promo function onstage?) and fans has a bad impression of him afterward. I remember coming across these headlines vaguely in the past, but recall all the details. I remember the drug thing. William So looked very thin then, like a drug addict. After that he disappeared and cleaned up I suppose since he looks good now. I remember now Jayne. I think William was linked to drugs and it was when he had those so nice and so good albums, which was his peak. Edmond also had a drinking problem in the past as well. While Edmond’s popularity never peaked like Andy hui or had hit song as big as William so, he did have quite a few good songs. For instance- “breathe”, “good friend”, “man in the closet”, “7 friends”, etc. He just had bad luck w/ record companies and a goofball drinking hobby. He has a good voice and even did falsetto before Leo made it popular. Ironically, D!cky is the only one of the Big 4 who won first place in the ‘New Talent Singing Awards’. All 4 of them join the entertainment industry through TVB ‘New Talent Singing Awards’ but they joined in different years. Andy and William got first runner up in their respective contest while Edmond was a finalist in his. My favourite song of Edmond’s is ‘Lingering Game’ (纏綿遊戲). Was this song a hit back then? Leo has a good voice, a DJ sort of voice but even now he sings without emotion. Dicky is awesome as an actor, not sure about him in this mv. No really suitable. Any news about him making more drama/comedy for hong kong? I hate all of their MV! Especially Cyndi, It was just plain creepy!! Big four MV doesnt match them! To me Show lo MV there seem to be a lot of CG going on, even though they say the tank and the eugine is real it looks so CG no point of getting a real one! And the custumes/clothes is pretty bad, looking at that spike jacket it seems like it is made out of aluminum foil! Out of all of them I like Show lo MV best, love the dancing! Overall love the songs but the MV ruin it! Big Four’s song was actually catchy, easy to get addicted too. It is a good thing that they didn’t use the autotune like a lot of dancing songs, I kinda get tired of all the autotune that has been in most of the dancing songs nowdays. ohh and show Lu’s intro, looked like those movie intros lol. i didn’t like the intro, found it to be alittlebit boring, so it felt like it lasted forever when the intro was just for a minute. I always like how the Taiwanese artists make their MVs, including Show Luo, Jolin Tsai, Elva, etc. HK MVs basically can’t compare. it’s nice if u are into the canto ballad. Omg who said William is ugly? I find him the most handsome out of all of them! I’m glad bc ppl always called him ugly. He looks good. I like that he’s not spare ribs like .. Or short. Haha. got bored with show luo style after a while, nothing new. I like his earlier MV better. He is hardworking artist though but can’t really sing. He always strike me as a bi-sexual, don’t know why, probably because of the cheetah print hehehe. I was reading there is some kind of fight over weibo between Him and Anthony Wong. Seeing double between Adam Lambert and Show lo. Nothing wrong to be heterosexual or etc…just the matter about he’s too “Fake”. mmm…Cyndi always seem the same ,act cute doesn’t work on her anymore .Please grow up a lil bit Cyndi .Big 4 consider talnted artis /singer .But this MV make me puke …gotta minus some point for them now. Andy Hui and william so use to be my favourite artis but trying something new is good ..but when thing going wrong that make you like …. ! Very few men accept they are not kids anymore. The 4 heavenly king handled their aging well but I find big 4 trying too hard to be young and hype. I see Leo my trying to be hip also. I like Big 4, but not this song, not this MV, not this style. I don’t know, but I feel that they might be going for this “hip” look because of William’s influence? He’s the fashionista here. The other 3 were never this kind of style. Didn’t like Show’s MV too. It’s always this similar style, no surprise, no improvement. Don’t like the song too. Cyndi is pretty and sings not bad, but at 3o years old, she should stop with her cutesy image. And I do find this MV a bit creepy, although it’s more unique. This is Jam Hsiao’s latest song [Holmes] from his album [It’s All About Love]. The album is produced by Jam himself. Listen and feel the difference. Those songs are just plain boring! Show Lo’s song is like those K-pop group where 9 out of 10 groups are singing the same type of songs! Enough of typical karaoke songs already!